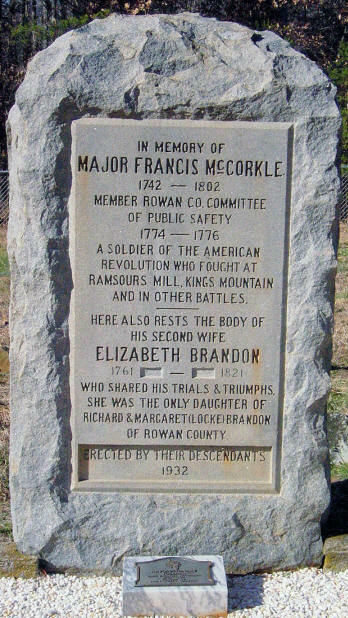 Francis Marion McCorkle, Sr. was born on 01 Sep 1742 in Rowan Co., NC, to Matthew McCorkle and Jean Givens. Matthew and Jean came to America (Pennsylvania) around 1740. They were staunch Presbyterians. Family tradition claims Jean’s brother, Ned, a youth at the time, stowed away on the ship until it was too far to turn back. Descriptions of Francis' physical appearance say that he had a fine personal appearance - florid complexion, auburn hair and was over six feet tall as well as having an amiable disposition. Francis Marion McCorkle acquired a marriage bond on 26 Aug 1768 but his actual marriage to Sara Jean Work seems to have been 01 Sep 1768 in Anson/Rowan County, North Carolina on some ancestry records; John Work, bondsman; Thomas Frohock, witness. The area in North Carolina where the McCorkle family lived changed several times during their lifetime. Originally, Rowan County was a vast territory with an indefinite western boundary. Tryon County was formed in 1768 from the part of Mecklenburg County west of the Catawba River. In 1779 Lincoln County was formed from the eastern part of Tryon County. In 1842, Catawba County was formed from the upper third part of Lincoln County. You also have to take into consideration that Francis Marion McCorkle Sr. owned over 4100 acres of property in this area. As his family increased, Francis Marion McCorkle began to purchase and sell land. One of these pieces of property was on the west side of Catawba River, on one of the tributaries of Mountain Creek, in the limits of the present County of Catawba. Here he started a farm, planted an orchard, and by industry and skill began rapidly to accumulate property - over 4100 acres before he was finished. A Deed of Sale from Francis McCorkle & Sarah his Wife to Peter Linebarger for 200 Acres Dated the 1st Day of August in the year of our Lord 1772 proved by Leonard Sailer Evidence thereto. Ord'd to be Reg'd. A Deed of Sale from Francis McCorkle & Sarah his wife for 250 acres of Land Dated the 17 Day of January 1775 proved by Archibald Fleming Evidence thereto. Ordered to be Registered. Francis Marion McCorkle lived in Mountain Creek about two miles north of Denver and served as an active member of the Rowan Committee of Public Safety, meeting thirty miles away in Salisbury, North Carolina, from 1774 to 1775 - at the beginning of the Revolutionary War . When the Revolutionary War came, Francis Marion McCorkle promptly took his place on the side of the Patriots. In 1774, he was appointed a member of the Committee of Safety of Rowan County, NC, along with John Brevard, Matthew Locke and others. (See Wheeler's Sketches, Vol 2, p 360.) Although a full thirty miles from his home, he is recorded as being present in Salisbury at the regular meetings of the committee, and is named in the records as the Captain of a Company - eventually becoming Major. Rowan County, North Carolina had nine militia companies. Captain Francis McCorkle commanded one of the companies from the current Catawba County area consisting of over 100 men. As an active Patriot, Major Francis McCorkle fought at the battles of King's Mountain, Ramseur's Mill and Cowpens, serving as a Major - as well as the skirmish against Tarleton at Torrence Tavern. His patriotic actions excited the animosity of the Tories and he was frequently compelled to keep away from his home to escape their vengeance. A morning or two before the battle of Ramour's Mill, Francis and a man by the name of Smith rode out before daybreak to learn the whereabouts of the Tories, knowing that they were in the neighborhood. Arriving at a neighbor's house near the head of the creek about daylight, they inquired of the lady if she knew where the Tories were. She replied that she was expecting them any moment. Upon hearing this they wheeled around and rode home in a hurry to arrange matters. After brief preparations they left home and were scarcely out of sight before the Tories arrived. The Tories searched the house from garret to cellar for Major McCorkle. They found there some salt at the McCorkle home which they appeared to want. They left word that if Major McCorkle would come and bring them some salt, all would be well - but if not, they would come and destroy everything in his house. Instead of joining them, McCorkle and Smith hastened to the Patriot soldiers that were centering at Ramsour's Mill and were in the battle there. After the battle of Ramsour's Mill, Smith returned and reported that Major McCorkle had been killed. To the great joy of his family, Francis soon rode up alive and unharmed. He then ventured to sleep in his own house for a few nights. About the third night, Francis was suddenly awakened by the sound of horse's hoofs. Hearing his name called, he answered, and was told to put on his clothes but then with abusive words they told him it was no use, as they intended to kill him. They then asked him "whom he was for?" He replied that he did not know whether they were friends or foes, but if he had to die, he would die with the truth in his mouth - he was for liberty. He was then told to put on his clothes, that they had more of his sort, and they would slay them all together. He went with them, but when he arrived at the main body, he was agreeably surprised to learn that they were all Patriots, and that they had met for a jollification after the Battle of Ramsour's Mill and wished to have him in their company. After the British crossed the Catawba River at Cowan's Ford, Major McCorkle made a narrow escape. Major Francis Marion McCorkle was in the affair at Torrence's Tavern, with his friend Smith. The two men, either acting as a kind of rear guard or sent back to reconnoiter, were discovered by the British, and wheeling around on their horses attempted to rejoin their comrades. Smith's horse bolted through the woods and he was killed. The enemy pursued McCorkle until he came up to the little band of Tories, who had formed in Torrence's Lane. The little party fought the British troopers under Colonel Tarleton, until the smoke became so dense that they could not tell whether they were among friends or enemies. As the smoke cleared off a little, McCorkle discovered that he was among the redcoats, and putting his hands on a stake-and-ridered fence, he leaped through just as three or four sabers struck the rail above him. They all retreated and made good their escape - none being killed except Smith, before named. Several British soldiers were killed and buried east of the Featherston House. In 1778 a Petition to the Assembly for the creation of a new county west of the Catawba River was signed by Francis McCorkle, Moses Sherrill and others. Francis' wife Sarah Work McCorkle died 01 Jan 1779 at the age of 29 leaving him with five small children all under the age of ten. During the Revolutionary War, after the battle of Charleston, S.C., Francis married his second wife, Elizabeth "Betsy" Brandon, on 13 Apr 1780 in Salisbury, NC (Rowan County), only 13 months after the death of Sarah. At the age of 19, Betsy became the step-mother of Francis' five children. Francis was twenty years older than Betsy. Elizabeth "Betsy" Brandon was born about 1761. Francis Marion McCorkle Sr. and Elizabeth "Betsy" Brandon McCorkle had ten children, all born in the Mountain Creek area of Lincoln/Catawba County, North Carolina. Major Francis Marion McCorkle was well respected and esteemed by his neighbors. WILLIAM RANKIN, sheriff (Lincoln Co.) to FRANCIS McCORKEL (Lincoln Co.) for 76L NC money sold 300 acres on west side of Catawba River and both sides of Mountain Creek; part of two tracts "adjoining round ALEXANDER WORK'S land the remainder part of what ALEXANDER WORK left out of his lines"; granted 18 Apr 1777 to JOHN WORK; sold due to writ, dated 3 Nov 1795 & signed by ABNER SHARPE, from Iredell Co. court to collect 600L NC money from HANNAH WORK & ADAM BREVARD, administrators of JOHN WORK deceased, due to suit of FRANCIS McCORKEL; sale authorized by act of the Assembly passed at Wilmington 25 Oct 1764. Signed W. RANKIN. Witness: none. Rec. Apr 1797. WILLIAM RANKIN, sheriff (Lincoln Co.) to FRANCIS McCORKEL (Lincoln Co.) for 76L sold 500 acres on west side of Catawba River on east side of Mountain Creek on heard of Beaverdam Branch of Mountain Creek; border on east side of JOHN WORK'S "other" survey and BENJAMIN PERKINS' line; granted 18 Apr 1771 to JOHN WORK; sold due to writ, dated 3 Nov 1795 & signed by ABNER SHARP, from Iredell Co. court to collect 600L money from HANNAH WORK & ADAM BREVARD, administrators of estate of JOHN WORK deceased, due to suit of FRANCIS McCORKEL; sale authorized by act of Assembly passed in Wilmington 25 Oct 1764. Signed W. RANKIN. Witness: none. Rec. Apr 1797. WILLIAM RANKIN sheriff (Lincoln Co.) to FRANCIS McCORKEL (Lincoln Co.) for 60L sold 500 acres on west side of Catawba River on east side of Mountain Creek; border: JOSEPH CRONKLETON; granted 18 Apr 1771 to JOHN WORK; sold due to writ, dated 3 Nov 1795 & signed by ABNER SHARP, from Iredell Co court to estate of JOHN WORK deceased, due to suit of FRANCIS McCORKEL; sale authorized by act of Assembly passed in Wilmington 25 Oct 1764. Signed W. RANKIN. Witness: none. Rec Apr 1797. WILLIAM RANKIN, sheriff (Lincoln Co.) to FRANCIS McCORKEL (Lincoln Co.); for 70L sold 500 acres on west side of Catawba River and east side of Mountain Creek; border WILLIAM PERKINS and JOHN WORK'S "other" land; granted 18 Apr 1771 to JOHN WORK; sold due to writ dated 3 Nov 1795 & signed by ABNER SHARP, from Iredell Co. court to collect 600L NC money from HANNAH WORK & ADAM BREVARD, administrators of estate of JOHN WORK deceased, due to suit of FRANCIS McCORKEL; said authorized by act of Assembly passed in Wilmington 25 Oct 1764. Signed W. RANKIN. Witness: none. Rec. Apr 1797. Francis McCorkle had a large estate and many slaves. He was farming 1000 acres of land at the time of his first marriage and according to the 1800 Census, he had 14 slaves. Major Francis Marion McCorkle Sr. died 09 Oct 1802 and was buried in the McCorkle Family Cemetery in Terrell, NC, just off of Hwy. 150. Elizabeth "Betsy" Brandon McCorkle died on 20 Jan 1821 in Lincoln County, NC, and was also buried in the McCorkle Family Cemetery in Terrell, NC. At the old McCorkle Family Cemetery, two miles north of Denver, a huge boulder was unveiled on 02 Sep 1932, in memory of Major Francis Marion McCorkle, a Revolutionary patriot, and his wife, 'Betsy' Brandon, and bears the following inscription: "In memory of Major Francis McCorkle (1741-1802) a soldier of the American Revolution, who fought at Ramsour's Mill, Kings Mountain, and other battles. Here also rests the body of his second wife, Elizabeth Brandon (1761-1801), who shared his trials and triumphs. She was a daughter of Richard and Margaret Locke Brandon, of Rowan County." It was erected by their descendants in 1932. About three hundred of their descendants were present and addresses were made by George McCorkle of Washington, Judge Wilson Warlick of Newton, and William L. Sherrill, of Charlotte." On June 14, 1933, a marker erected by the Elizabeth Maxwell Steele Chapter, D.A.R. of Salisbury, commemorating the event, was placed by the roadside in front of the original homesite of her father, Richard Brandon. In January 1976, the Sons of the American Revolution erected a historical marker in his honor on NC 150 near his burial place on Lake Norman, in Catawba Co, NC. CHILDREN of FRANCIS MARION McCORKLE, Sr.
Francis Marion McCorkle had five children by his first marriage to Sarah Jean Work. The couple had two sons, Matthew McCorkle and Alexander Work McCorkle. These men lived on Mountain Creek, but never married. Alexander W. McCorkle was a man of wealth and of fine judgment and business talents. He was frequently called upon to advise his neighbors in business affairs, and to aid them in making deeds and conveyances. Matthew McCorkle was not mentioned in the final division of the 4162 1/2 acres of property owned by Francis Marion McCorkle Sr., however, (1) Alexander McCorkle (son), (2) Gilbert Milligan (son-in-law) and his wife Rebecca McCorkle, (3) Charles Beatty (grandson) and (4) George Little and his wife Elizabeth Salena Beatty (granddaughter), jointly received Lot 5, containing 254 acres (equivalent in value to 595 acres their share). Also listed as petitioners were (1) Joel Houston and his wife Elizabeth L., (2) Isabella McCorkle Beatty (daughter) and (3) Thomas Loftin and his wife Sarah Lavina Beatty Loftin. These were identified along with the others to receive part of Lot 5 but they were not listed in the final division. Charles Manson Beatty, Elizabeth "Betsy" Salina Beatty Little and Sarah "Sallie" Lavina Beatty Loftin were the children of Isabella McCorkle Beatty (daughter of Frances Marion McCorkle & Sarah Jean Work) who married William Beatty. Major Francis Marion McCorkle had ten children by his second wife Elizabeth Brandon. The children of William B. McCorkle were: James Marshall McCorkle, Esq of Salisbury; Dr. John R. McCorkle of Mooresville; William A. McCorkle of Jefferson County, TN; and daughters, Sarah, Mary, Cornelia, and Caroline. William Brandon McCorkle received a large land inheritance from his father, Lot 14, containing 793 acres which was his equal share. 2. Francis McCorkle Jr. lived on Mountain Creek and married Elizabeth Abernathy. Their children were: Matthew Locke McCorkle of Newton; Thomas, David, and Fanny. David died during the Civil War, serving in the Confederate army. 3. Thomas L. McCorkle Sr. married Casimia "Casey" Sherrill and moved to Georgia. 4. John H. McCorkle moved to Tennessee. His son, Dr. Francis Marion McCorkle, collected the principal facts of this article. 5. Elizabeth McCorkle married Jephtha Sherill, and was the mother of Henderson Sherrill, who lived in Hickory Nut Gap for a long time. He served in the Legislature. According to the 1850 Slave Schedule, two of Francis Sr.'s sons, Francis Jr. and Alexander, owned slaves just like their father did.